I have a costume theme night coming up ... the theme is nautical and island, but I wanted to do something a little outside the box. 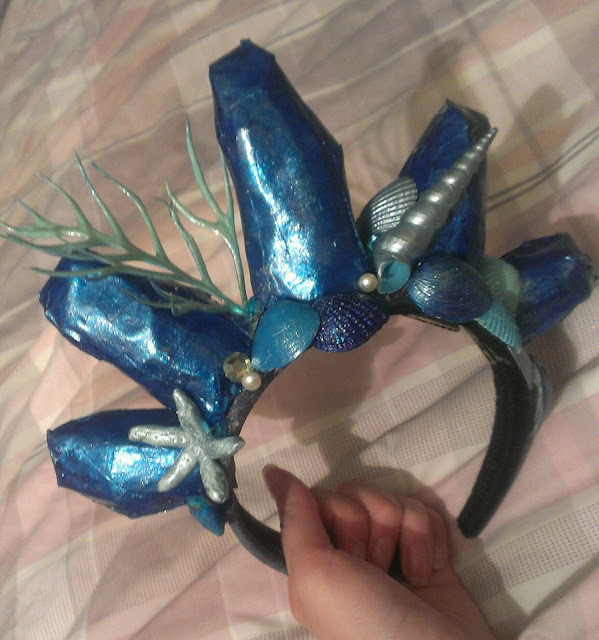 In the mix of pirates and mermaids, I thought I would be an ondine - something like a sea nymph, if you will - but I wanted to make a crown too ... just to make it a little more sea-esque. Next up, figuring out how to make a belt! Next, I paper-mâchéd my spikes. This was quite difficult - as you can see from the imperfections, but I like that it adds to the character of the piece.I only did the front of the spikes, not the back. I stuffed the front with newspaper and left the back flat, but I made sure to cover both in the gooey-paper for consistency and texture. I let dry overnight. I then painted my spikes in blue. If your nail polish will cover the newspaper, this step isn't needed, but I used paint first, then nail polish. Paint everything with nail polish (I went with glitters and blues) - including shells and coral. Assemble. It will take a bit of hot glue to make everything stick - especially on a velvet base (I went with velvet for the comfort. Make sure it has a wide base! This'll help hold things on. My tip is to figure out where you want everything first. And layer, layer, layer. It'll help make things easier when you stick everything down. Let dye.